My son had availed services of M/s OES Consultants and secured admission in the course 'Master of Data Science' in Monash University, Melbourne. Now, I feel extremely happy to inform that he has successfully completed his course and has been awarded the degree of 'Master of Data Science' from Monash University. I recall with extreme gratitude, excellent services rendered by OES Consultants for facilitating my son's admission in Monash University. Great many thanks to M/s OES Consultants Team led by Mr Dilip Rai. Sudesh and I want to thank you for the extensive support and guidance provided to us during the course of our application. It is an immense pleasure to have worked with such an experienced and Knowledgeable team. Thank you for guiding us in every step of the process. One stop for all your overseas queries, form application to shortlist to visa, you name it they will help you with that. Very knowledgeable staff and a clear cut procedure to help you guys decide your future. Many thanks for all your timely support. My special thanks to Dilip Rai and Sushmitha for providing immense guidelines. I wish you more success in your future endeavour. Definitely I will recommend OES to others who are aspiring to study in New Zealand. If you are looking for any guidance of study abroad process.. this is the place to go. People in here are competent and could be relied upon for overseas admission and visa help. I highly recommend OES consultants. P.S : My heartfelt thanks to Dilip sir and Ritu who helped me a great deal throughout the process. They are the best at what they do. Very professional at their job. Thank you Dilip Sir and your whole team for assisting me throughout my admission and visa process. Thank you so much for your help in getting the VISA. I feel so grateful for all the work done. I did a great decision to work with you guys, else don't think it could have been possible. Thank you again for all your sincere efforts in helping me to get the VISA. Special thanks to Dilip Sir and Sushmita!! Best consulting agency in Bangalore. Hassle free visa and admission process. A big thanks to Sushmita and Dilip sir for their guidance and help, always ready to clear all the doubts with patience. I would surely recommend oes to anyone willing to pursue their dreams to study in New Zealand and Australia. I am really happy that I received by Visa without much delay. Thanks a lot Dilip and the OES team for your continuous help and support from the admission process to Visa documentation. Appreciate your patience in answering all my queries politely. It would have been a hard time if I had chosen to apply myself. Thank you so much for all your services. Heart felt thanks and warm hug to all of you at OES .Right from giving the right guidance to patiently listening and helping out throughout the admission process you guys have proved to be the best. Keep up the good work and professionalism . special thanks to Dilip sir and Ritu mam. I sincerely thank you for the support you have provided throughout the admission procedure from the course selection till visa guidance. We especially appreciate your proactive approach and prompt behavior in resolving issues and hurdles. Thank you for being available at all times for clarifying queries. After my initial homework on the Australian universities for my Master's program, I did not have to worry much about anything else. OES took it from there and provided spot on guidances. The response time over phone as well as through email was very quick. I received my university acceptance and student visa as well as the student dependant visas earlier than the processing times because I believe that my supporting documents were all in proper order, thanks to OES. Mr. Dilip Rai and his team are real stars. OES is an amazing agency who helps from scratch. What I loved most about them is that they personally get to know you and assist you with absolutely everything you want to know. They are hassle free and respond to emails instantly. Special thanks to Mr. Dilip who has been so helpful from beginning to end. OES makes your work extremely simple by guiding you in the easiest way possible. I am so glad to have gotten to know them! Thank you Mr. Dilip and your team to have made my dreams come true. I would highly recommend OES to all my friends who have been wanting to go abroad to study. Cheers! This is Varsha and I landed in Melbourne last night. The place is really nice. I wanted to personally thank you for all that you have done to make this so easy and hassle free for me. It was a wonderful choice I made by choosing OES to do my masters application process. I m very happy and satisfied and I believe it was all possible because of you. So once again thank you very much. Also, I strongly recommend OES to some of my friends who are planning to do their masters soon. I really appreciate the effort done by you and your team to give me such a good experience! 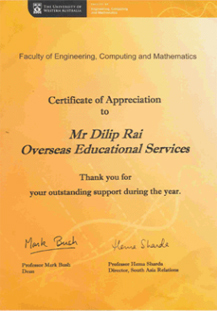 OES is undoubtedly one of the best consultancies in Bangalore.Mr Dilip Rai and his team provide commendable service .They not only give you right guidance about the course and the university but also take care of your application process and visa.I am glad I had been to OES for I received the most sterling service. Thank you so much, Dilip and team. I am overjoyed!! I appreciate your help from the start. This was easily the best experience I have had with migrating abroad. I will be in touch. Three cheers to OES!!! I'm really glad that I was recommended to visit OES by my aunt to decide but pursuing my studies abroad. It has been a very smooth journey throughout the process. Dr Dilip Rai gave me the right guidance and made it even more convenient for us to get through the procedures. I'm really grateful and thankful for everything. And I highly recommend OES for people who consider their decision to pursue higher studies abroad. We are really happy that we considered going to OES. OES is a saviour for students who are confused between what course is good where. Mr. Dilip has immense knowledge in the education industry overseas and will guide you in such a way that helps you in the long term. All I had to do was furnish some documents to his team, everything else was done with them. I literally had nothing to do. Highly impressed by the professional approach and interest that they take in each student. One of the best consultancy had wonderful experience. Every step in the procedure was taken care of in a very smooth way. Hands down the best consultancy in Bangalore, Dilip sir was very informative and helped me through each process.They know exactly which college needs what. Big thanks to Ritu as well. Overseas Education services is the best service regarding higher education,especially Dilip Rai sir supported me in each & every situation. I received my visa within 24hours just because he has guided me for my visa process & responded for my doubts really feeling great to have guidance with Dilip sir & lastly the staffs in OES is responsive & also guided me in achieving my task especially Ritu. Thank you for helping me to achieve my goal. I tried many agencies and finally came to know about OES. The service was great and swift all my works from application to receiving visa was done within 2 months, thank you so much. I feel great consulting OES (Overseas educational services). Wonderful experience from initial process of applying to university till my visa is granted. They helped me in guiding the necessary documents required for an applicant. I appreciate the effort and time invested by OES staff and Dilip Rai sir helping students achieving their dream wish into reality. I would recommend students planning for higher studies, Consult OES for great ideas and opportunities with respect to planning your study career. I m grateful to OES and Thank you for all your effort ,support and guidance. It's really a wonderful experience consulting OVERSEAS EDUCATIONAL SERVICES. I was very much worried weather I could go to pursue my masters and Chase my dreams abroad. The confidence they filled in me and their honesty and agility in work resulted in fetching a hassle free student visa in less than 7 working days. Their experience in this field for more than a decade will help students who are aspiring for their higher education overseas in getting a strong foundation and a ready future. I am great-full to OES as they are the best consultancy to look for abroad education. Dilip Sir understanding towards things are perfect and his estimations are always result worthy and I would also like to thank Ritu, for her assistance since I associated with OES. Overseas Educational Services really helped me in applying for various Australian Universities under my reach. They managed the whole process in a very simple way. It was a real good experience right from applying for universities to visa approval. I liked their approach in counseling the applicant in document management. Great! Very helpful in guiding students in their higher studies, right from choosing and applying to the universities til the VISA procedures. Mr. Dilip Rai and his team helped me a lot in my admission into the University of New South Wales, Sydney. These people are really good and people friendly especially Dilip Sir. His understanding towards things are perfect and his estimations are always result worthy and I would also like to thank Ritu, She is like a bridge between me and Dilip Sir and once again thanks to both of you. I will recommend OES to all the students who wants to pursue abroad education..Thanks a lot. Really great services. Friendly and answers every call. Many reviewer wrote many good about Dilip sir which is true. But I want to highlight Susmita one of the staff of OES. She is superlative, excellent, promt , very friendly... Work like a true expert. Any question you have she has a logical answer with proof. Dedication and patience has no words to explain. Hope she will rise and shine and keep establishing many life through her guidance , knowledge and experience in international education industry. The team run by Mr. Rai at OES is very efficient, helpful and ready to answer your most mundane questions. They are always quick to respond to your queries and made the process of choosing the right course and the right University very easy. The application process for both University and the visa was taken care of very systematically and they know exactly the documents that are needed for hassle free approval. Special thanks to Ms. Sushmita for being patient and very helpful. Hello!! This is Anusuya Dawn here. I wanted to convey thanks to Dileep Sir and Ms.Sushmita for helping and guiding me to get a chance to study in New Zealand. It has been almost a month I reached here and settled down. Thank you for choosing this place and University. I'm grateful to OES for helping me out. Choosing where to study can be a daunting task, but with Overseas Educational Services (OES) this has been an incredibly rewarding experience for me. The team at OES are true professionals and were there for me in every step of the process. Mr Dilip Rai with his years of experience in this field is the right person to seek advice from on courses to take and universities.Anybody looking to start their study abroad journey, my simple advice to get started off on the right foot is OES Consultants. I have had a wonderful experience with the consultancy. The main consultant Mr. Dilip Rai is very helpful and very patient, helped me through all the processes especially with the visa proceedings. He is very approachable and helpful.The staff Sushmitha is very active and updates you on all the details very quickly. I had a made good choice choosing OES CONSULTANTS and I am very grateful for all they have done for me. Would definitely recommend it to others. I had a wonderful experience with OES. I really appreciate the initiative taken by Mr. Dilip Rai to guide me throughout my Visa process and get everything set. It was an wonderful experience and I would say that OES is the best consultant anyone can get. Thank you OES team. You guys are doing a wonderful job. My experience with Overseas was awesome . I reached there confused which country to go to for pursuing my masters and by the guidance of Dilip Rai Sir at Overseas he cleared all my confusions and helped me in making a decision. The process was so smooth everything went hassle free from the GTE interview of the university till visa reception was very systematic. Their follow up is also amazing. This is a place you can trust if you want to study abroad. Went to OES after several recommendations and the entire process of admissions were done very systematically. There were no problems or delays and they're assistance never lacked even when I delayed my admission by a few months. I would recommend OES for overseas admission since they are well versed with the entire process of university admissions. Best consultants for overseas education in Bangalore. Fantastic job by Mr. Dilip Rai and team. 10/10. Would recommend to everyone. Best 100% results. Clear documentation and information process. Student and 2 dependent visas processed successfully for me. OES provides excellent hassle free services. They make sure no kind of inconvenience is caused to the students and always inform about the progress of the application constantly. Starting from selecting a course, university to finding accommodation in the country chosen, they help the students providing no inconvenience. Mr Dilip Rai handles the proceedings with so much ease ensuring that the students are not burdened with anything. Ritu does an amazing job. If you are looking to go abroad for higher education, I strongly recommend OES. OES consultancy was referred to me by my senior . And yes I made a right choice in choosing . They helped in selecting the best I would get .And Dilip sir was always encouraging . And special thanks to Sushmitha Mam she helped in every single step and to answer all the questions I had ! And finally I got admission in �The university of Auckland �.i would tell OES is the best consultancy in Bangalore!! Thank you so much for making my wishes come true! Kudos to team at OES, admission to VISA process was hassle free, OES team is friendly and available to help at every step. I had a wonderful experience with OES. They do a fantastic Job for the end to end application process from selecting the most suitable University till arrival of your Visa. I have attended many educational fairs, but only OES gave me an opportunity to meet university representatives one on one which helped them remember me as their applicant and build rapport. Mr Dilip Rai, Director of OES has been the biggest support throughout my application process for the University of Auckland. He is extremely approachable and one can just walk in to clarify any doubt. They have a very systematic office and cater to your needs completely; I remember requesting them to review my essay and profile, accommodation assistance, Visa formalities and many more, everything was executed seamlessly. A special Mention to Ms. Sushmita, who has helped me with the most minute of details at any time! I would definitely recommend OES to anyone who is looking to study abroad and to blindly trust them with your application. I have even received a scholarship of 20,000 NZD which was beyond my expectation, but without Dilip Sir and his entire team this wouldn't have been Possible. There are many educational consultants out there and to trust on one is not easy. I learned about OES through online sources. After reading their remarkable reviews from ex-students I decided. My journey with them started at the educational fair that they held in Bengaluru. Then after meeting Dilip sir I knew I made the right choice. From the start he and his team guided me in every step, (application to visa). The overall process which seemed impossible earlier was made simple and easy just because of Dilip sir and his team. Although I made innumerable enquiry calls about the silliest things, they were always polite and patient with me. For this I have to give it to them. No other consultants I've come across has shown such integrity as OES has. They were always ahead of time with the process and I even received my VISA within 12 days. So, there is definitely nothing I can complain about. My experience with OES was unbelievable. I'm only thankful to Dilip sir for everything. I have arrived in Australia and I have completed my enrolment at Monash University. Thankyou very much for all the support throughout my application process. It was a warm and a happy experience. I will definitely recommend OES to my family and friends. I am leaving for Sydney UTS tonight. Thank you, for all the advise and expert guidance. Have a good day sir and my regards to your team especially Miss Ritu . OES was suggested by a friend and as he said they were very helpful. They helped me completely from the shortlisting of the universities till the day I received my visa. Had a wonderful experience and everything went by very smoothly. I went to OES after it was suggested by my friend. She told me they are probably the best in Bangalore and she's actually gone to quite a few consultants. And she was right. If you're looking for a no nonsense place, that tells you exactly what you want to know and does everything from trying to find a suitable course of your choice to getting your Visa in hand, this is the place to go to. The staff's always courteous and really patient and at the end of the day, you'd be happy with the service that has been provided. HI everyone, I just want to share true story about my experience with OES. From consultation to visa filing , the process is hassle free.They helped me in every aspect from applying to a course till filling of visa application and assistance.Had a Great Experience from Dilip Sir, Ritu mam and everyone else, they were really Helpful at all point. I strongly recommend you for OES and I would like to say Thanks again for all the help! Had a wonderful experience with Overseas Educational Services - OES. They helped me in every aspect from applying to a course till filling of visa application and assistance. 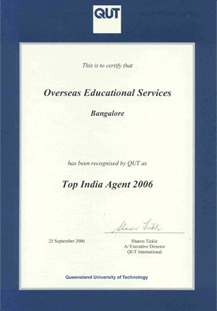 No Question why OES are one of the best Consultants in India for Admission to Overseas Universities. Very knowledgeable team, handhold'ed me till the last step. One of the best decision to choose OES. My experience with Dilip sir and his team has been wonderful. They have answered to all my queries and helped me with each step of the way to get into my desired university. The entire process was made easy for the applicant and I would highly recommend OES to anyone desires to study abroad. OES makes each and every process very easy and botherless! Team OES is helping students career in all the possible ways, I am very grateful for the service provided by OES without taking a single penny from any student. If there is way I can pay you guys back from doing some service, it will be my pleasure. Had a pleasant experience with Overseas Educational Services- OES, M.G. Road, Bangalore. From day one they processed my application in the most professional manner and gave me all the details necessary for my admission to Monash University, Melbourne. They keep giving all the necessary updates for admission and visa processing without any delays. They are one of the best overseas consultants in Bangalore, and their work shows for it. Would definitely recommend this consultancy if one is looking for education abroad. Those looking for higher studies abroad , I highly recommend to choose OES consultancy. From consultation to visa filing , the process is hassle free. The guidance provided is very much reliable and the team working behind for all the process till visa filing is very professional and patient . A sense of personal touch is provided to each student throughout the process. OES provided a fantastic overall experience. Their service is highly customised to suit the backgrounds and expectation of the students. The process was seamless and they handled all my queries from guidance on the course/university to visa processing. Moreover, the staff and director are extremely welcoming and friendly. If you are in Bangalore, look no further, you are in good hands. OES is a very good consultancy. They will help us to study abroad. They are very supportive and make us easy to get it done. One who is having dream to study abroad should visit here. My friend studying in Australia recommended OES to me. I am totally satisfied with their admissions services and the speed and ease with which I received my Australian visa. I would definitely recommend OES to anyone who is looking to study abroad. From the time I've landed nz I wanted to text you but due to situations I could not. Sir I wholeheartedly thank you for everything sir. You're guidance and constant support has made me come till here. All is going on well Sir. Had orientation yesterday and today. And most of my works are done. Will keep in touch always sir. Had a Great Experience from Dilip Sir and everyone else, they were really Helpful at all points of time with regards to my Application or VISA process. OES was referred to me by a friend and after looking at all the consultants I finally decided to go with OES and I am glad I made that decision as they gave me the right guidance and helped me through the process till the end. Amazing experience I have ever come across with a organization like OES, as my academics were average had a doubt me studying abroad, when I contacted OES they assured me that they will be helping me and finally when I had visa in my hand it was a dream come true ,thanks to Dileep sir and his people in office for their great help. I extend my whole hearted gratitude for the service and immese support I have had throughout my admission process. I have tried calling you over phone after getting my visa but couldnt get through. Once again thank you so much Sir. This wouldn't be possible without you and your team at OES. Thank you OES for getting me into the university of my choice. I am extremely satisfied with your services from the very start to very end, that is from the admission to all other documentation. I have recommended OES to many of my friends. Thank you for suggesting the best university for the course I wanted to do and also your help with documentation for visa. I have recommended OES to my friends that this is the best place if you want the right advise about universities and studying abroad. This is to thank you and appreciate your agency's able services in guiding my daughter Divya Kamaraju in her application process for admission to the University of Auckland as well in her visa application process. She is now in the University in Auckland pursuing her Master's. I reached Sydney on 17th. The college will be starting on Monday. Thanks a lot for the support from you and your team. I'll be thankful to you always. I hope this email finds you and your team in good health.I came to Australia in Feb 2015 and life has been great. I have had many opportunities and am progressing very well academically as well. I want to thank you all for the support and guidance you provided during my application process.It's very hard to find good people who genuinely just want to help students to build a career,I am glad I had the opportunity to meet you and your staff in Bangalore. I have only positive things to say about OES and highly recommend it to all students who are planning to go abroad for studies. I hope this mail finds you with good health spirit. I am very happy to have started my classes in uni and enjoying, my first week in New Zealand. I wish to thank you and the OES team for helping me to make this possible.Thank you very much. A big thank you to you and your team. You were very helpful from the beginning till the end. So thanks a lot for all the help and guidance, I am grateful for that. I will definitely suggest others to consult you if they have plans of studying abroad. I have arrived in Sydney and orientation starts tomorrow.I am writing to thank you and your team for all the efforts and guidance through the process,it wouldn't have been this smooth if not for you all.Thank you once again. I am doing good. Things are slowly falling into its places so, i am kind of excited.Thank you for everything sir.Thank you so much once again.. I thanks for all the help and guidance from your end which helped me in getting my visa successfully. Thanks, will keep in touch. I am really happy to inform you that, I got myself enrolled into my courses and they are going to start from 22nd of this month. I have also secured a part time job in one of the Indian restaurant nearby to my accommodation. I am grateful to you for all guidance and assistance provided by you. Sorry, couldn't get in touch. I had to take the last minute flight. The class have commenced here in the Victoria University and I am getting settled slowly here in wellington.Everything is comfortable. I am extremely thankful for all the guidance and assistance you and the team have provided me in getting this course. At every stage of the application process it was very smooth and comfortable. Many thanks again and will stay in touch with you.. I thank you and all the staff members for making things possible for me. My case was not taken by any agent and you gave me a positive response. I should say that you and all the members of your team have been very supportive , positive and most importantly polite. The team answered all my queries with patience. I am grateful for your hard work and I wish you and your organisation lots of success. Happy to recommend to other students. May god bless you. It would have not been possible without you all. I would like convey my deepest thankfulness for the interest shown in my favour. Thank you very much,sir If not for your confidence, we would not able to hear this news today. I would also like to thank Shyla for all her effort and time. I genuinely wanted to personally come down and convey my token of thanks, but unfortunately as I will be flying today, I will not able to do so. Thank you very once again.Will definitely recommend OES to my friends and family. I left the Country last night now I'm enroute to Melbourne. Sincerely grateful for all the help from you! You made this transition very smooth for me and I will always be thankful for that. Wish you the best!! We have so far attended couple of lectures, the people including the Professors are all nice and friendly all around AUT. Most importantly I'm writing this mail to thank you for all the work you did there on behalf of us to help us reach here.You helped right when we needed help most. I am grateful for you and your generosity. I want to thank you and your office staff for all the support and concern, We both are lucky to be part of the AUT University. I am leaving today. My flight is at 12 in the night. Thank you so much for all the help. This is ulupi here. I dont know whether you guys still remember me. Its been almost 8 months in Melbourne and its been great. Got two jobs; one in IT and one in officeworks which is like officedepot. All thanks to you guys for putting so much time and effort. Sorry took long enough to thank you. Better late than never. Keep up the good work guys. Thank you once again. Very happy to say that I have met Agambir today and he is now fully enrolled and will have his first class at 4pm today! Thank you soo much for all your help towards helping me to enrol for this semester and in obtaining the visa. Thanks once again for all your help. Its been a year now since I came to Auckland. I have finished my PG Diploma at Massey. I am writing this to Thank you from all my heart, since I remember you helped me with my application at each and every points of the procedure! This is true even with my Mother's and Brother's application for Australia! We all thank you for your great support and help. I am doing just fine and settled well in Australia. I have mentioned my contact details in Australia to any students coming from India to QUT for assistance to get them settled down and get accustomed to living in Brisbane. Hope they find it useful and I can be off maximum assistance for them. Thank you all for guidance / service provided to my son Suraj in successfully getting admission to RMIT, Australia. The follow up in getting his Visa on time has put us all in to comfort zone. Thanking you all once again. I reached New Zealamd safe and sound. The country is beautiful, so is the University. Thank you for all your help. Will be boarding flight in a few minutes once again thanking you. I reached well and things are slowly getting settled here. Hope every thing is fine with you and I thank you again for all your support. This is Vijay here. Just writing you to thank you for the help and guidance with everything that got me at this point.Will come to meet you when I make a visit to India in Jan-Feb.
Give my regards to the staff at office. Thanks. It has been a month since I have come here. All is well. Thanks for the help from you and your staff in Bangalore. I believe now that Australia was and is a better option. Hope you are doing as great as ever. I am fine here. All settled. The courses have started and assignments are already pouring. Kindly let me know when you come here next. I wanted to thank you for all your help and guidance. Please feel free to provide my contact details to anybody coming through OES, more than happy to guide them. Many thanks for your support. I have reached Auckland last week safely along with Shashidhara and we have enrolled for courses as well. Finding accommodation with cheap rate is a little difficult as we reached late and most of them are booked. Thanks again for all your help for my admission here. I'm well settled now at Brisbane and all good with me. Liking it here sir. Will keep in touch. Thank you for all the support and help. The University of Auckland is indeed a great place to study, as you had advised. Thank you for all the advice and guidance you have given me over the past one year. You have so patiently answered numerous queries that I had and made sure that my visa came on time. I would like thank you and your team from bottom of my heart. I thank you much for your support in the past few years without which I could'nt have got into this University. My classes too have started in full swing. I wish to do well. With your blessings and support I have successfully completed my first semester here at RMIT and I am now entering the second semester of my course. Hence I require your blessings for the next phases of my academic career. I thank you for my admission here at RMIT. Just wanted to say thank you soo much for all the help and guidance. I reached safely and the family stay is great. I met a few people from india and I am comfortably settling in. I would like to thank you for your help and guidance. I leave for Auckland today. I appreciate everything that you have done. Vanessa Mary Bosen - Massey University - July 2011. I reached safely @ Wellington on 24th Feb. Thank you for all the help and support given by you and team at all the stages of the process. Vineeth Kumar - Victoria University of Wellington - February 2011. Neha Muniraju - RMIT University - February 2011. We have met so many different people in our life, but you are so very different.You are Affectionate that touched our heart. We will never forget you sir. John Daniel - Unitec - February 2011.